What an incredible way to improve such a legendary car. Last month, we learned that Superformance, the company known for , was gearing up to bring a very special car to SEMA. 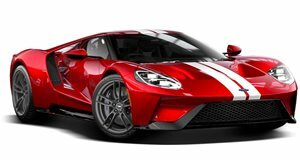 Though we , Superformance announced it would be equipping one of its GT40 continuation models with the 3.5-liter twin-turbo V6 EcoBoost engine from the modern Ford GT. Now the car has made its debut at the 2018 SEMA Auto Show, and boy is it stunning. It's called the Future GT Forty, and it is now available for order through Superformance. Pricing hasn't been made available yet but we assume it will be more expensive than a standard Superformance GT40, which starts at around $180,000. The Future GT Forty is meant to celebrate the 50th anniversary of the GT40’s first-place finish at the 1968 24 Hours of Le Mans endurance race and piggyback on the success of the current Ford GT in the GT class of the European Le Mans Series. The car was built in a partnership with Magnaflow exhaust, who fabricated a new exhaust for the EcoBoost engine. Garrett also provided new turbochargers, so the Future GT Forty likely produces even more than the 647 horsepower found in the current Ford GT. All of that power is sent to the rear wheels through a Quaife five-speed transaxle with a Centerforce dual friction clutch. In order to keep the car planted on the road, the Future GT Forty rides on HRE custom pin drive wheels wrapped in Michelin tires. Ridetech's Shockwave air suspension allows for an adjustable ride height and custom aero enhancements like carbon fiber front canards and the rear wing keep the car stable. As a nod to the new Ford GT race car, Superformance added a modern livery, racing decals, and modern lighting in the front and rear. This particular Future GT Forty belongs to the owner of Superformance, Doug Campbell, who originally had the car built for himself but decided it was so good, it should be sold to customers as well.